Bicycling is good for our community, for families and businesses. This is just one of the steps to make it easy for people to choose a bicycle for some of their daily trips. Bicycling is fun, economical and healthy, and this law helps remind all drivers to think about passing safely. When drivers give bicyclists more space as they pass, a leading cause of deadly collisions is minimized and more people feel comfortable about choosing to ride their bikes, which in turn promotes a more livable and economically viable community for us all. The law now requires motorists to give at least three feet of clearance when passing a bike in the same lane. If not enough space is available, the motorist must slow down and pass when no danger is present to the bicyclist. This is one step in a comprehensive set of actions local communities and the state are taking to make bicycling safe for people of all abilities. 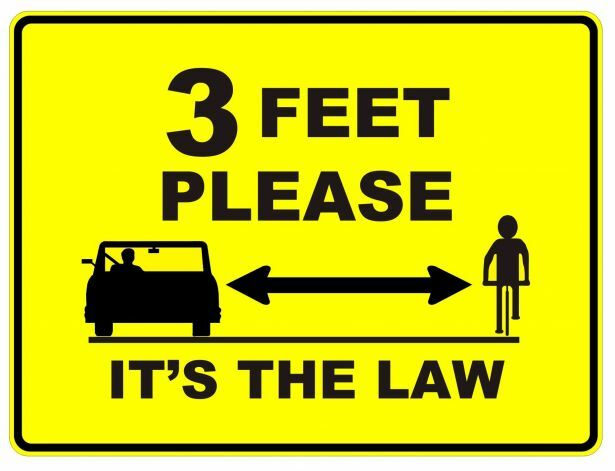 The three foot law goes into effect in California September 16th, 2014. A person traveling by bicycle on a street is vulnerable. Similarly, road construction crews are vulnerable. As are pedestrians – nearly 4,300 people died when hit by cars in 2010, according to National Highway Traffic Safety Administration data. 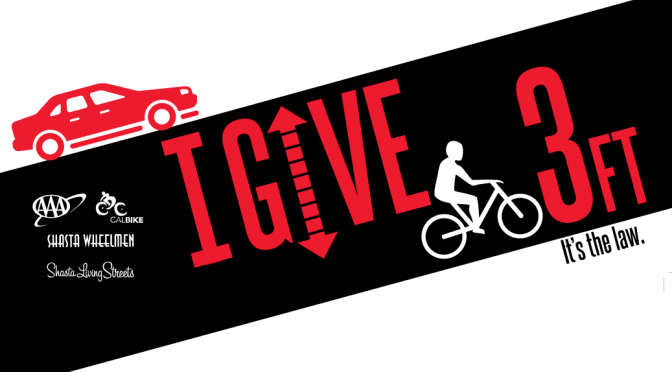 What you can do: Pass people on bicycles safely when you drive, giving at least a three foot buffer zone between your car and a person on a bicycle. Tap your brakes, slow down, and think about passing safely. Help your friends and family understand that by doing so they help prevent crashes that kill more adult bicyclists than any other cause in California and the US. A car obviously weighs several thousand pounds and a pedestrian or bicyclist, as a result, will lose in any collision. What if you can’t give three feet? The law requires drivers to slow down and wait until it’s possible to pass with a minimum of three feet. The key is to slow down and wait and decide how to pass safely. California embraces and is encouraging bike use. This law is one of the elements in that campaign. By California law, bicycles are legal vehicles on the street. 24 other states already have this law. Three feet is the minimum. Does the law prohibit a bike from passing a car closer than three feet, for example in a downtown area? No. Research has proven that with more people riding bikes the safety environment improves for all users as both motorists and bicyclists become more accustomed to sharing the road safely. More information and links at the bottom of this page. Previous PostURGENT Call to Action: Rightsizing on California StreetNext PostBig Bicycle Weekend Featuring the Shasta Jamboree Rides!